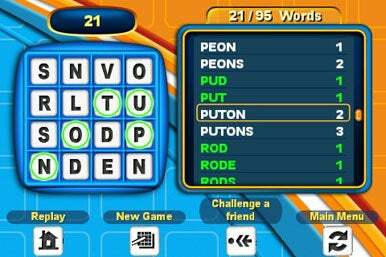 Boggle has entertained generations of word game players and now it’s available for the iPhone and iPod touch thanks to Electronic Arts. Unfortunately, EA has foisted a mediocre product on the public hoping to sell it with a brand name—a trend for the company’s casual game line. Word Play: Tap the letters in the 4-by-4 grid to spell out words in Electronic Arts' Boggle. Unfortunately, that Challenge a Friend button on the bottom of the screen is the closest you’ll get to multiplayer functionality. In Boggle, you shuffle 16 six-sided dice, each imprinted with letters, in a tray that holds the dice in a 4-by-4 grid. You must find words in sequences of letters on adjacent dice. You can go up, down, left, right, or diagonally. In the desktop game, you’re timed using a sand-filled hourglass; each turn is three minutes. Boggle for iPhone features three game modes: Classic, which adheres to the three-minute rule; Advanced, which lets you set your own time limit, features “Portal Cubes” that swap first and last positions when a word is formed, and has a “Panic Flip” that lets you find words using a new roll of the dice in the last 20 seconds of the game; and Self Score mode, a sandbox mode in which you play by your own rules and score yourself however you want. Making a word in Boggle for iPhone is as simple as touching the appropriate die. The game recognizes the tap and will circle the letter. Touching an adjacent letter elicits an arrow to show you where you tapped; a bar at the top of the window displays your emerging word. Once you’re done tapping the dice, you tap the final die again to create the word. If it’s in Boggle’s dictionary you’ll be rewarded with points and a “ding” sound, a screen flash and an unobtrusive animation showing the word go into your word list. If you make a mistake while you’re tapping out a word, just retrace your steps in reverse order by retapping the dice. Each word must be three letters or longer. If you’ve tapped out nonsense, Boggle responds with a honk. If you try to tap the same word twice in the same game, Boggle responds with a non-judgmental humming buzz and a red flash: handy feedback for someone playing with the sound turned down, or for someone with a hearing disability. Sometimes a fresh perspective helps you find words you might have missed—it’s a common strategy for Boggle players to rotate the tray of dice 90 degrees to see if new words jump out at them. You don’t have to rotate your iPhone to make this happen—just use put two fingers on the upper right and lower left hand corners of the virtual tray (where there are arrows pointing in a clockwise direction) and turn. Boggle makes use of the iPhone and iPod touch’s accelerometer, too: Shake the device at the start of your game to shake up the dice, which hop around for a moment before they settle into the tray. Once your three minutes is up in Classic mode, Boggle shows the total word list for that particular puzzle, with the words you’ve made highlighted in green. A small map of the game board is included, with each words circled on the dice, so you can see where they were in case you missed them. You can replay the same puzzle over again if you want to try to get more words, or you can play a new game. 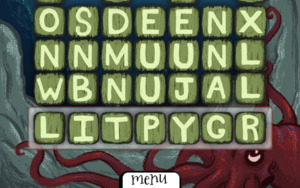 Boggle for the iPhone runs great, and that’s to developer Tricky Software’s credit. But the game is bereft of the one thing that would make Boggle worthwhile—there’s no multiplayer mode. You can “challenge a friend,” which simply creates a custom e-mail that tells your friends your score and encourages them to buy the game, with a link to the App Store. The absence of any sort of actual multiplayer mechanism—even a “pass and play” feature—dooms this game to the dustbin—particularly on a platform bulging with worthwhile Boggle alternatives. Boggle is compatible with any iPhone or iPod touch running the iPhone 2.2.1 software update.